The largest, least expensive, and most environmentally sound source of water to meet California’s future needs is the water currently being wasted in every sector of our economy. That’s the core message of a major new report on urban water use in California released by the Pacific Institute of Oakland, California. 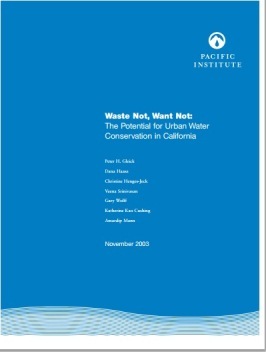 “Waste Not, Want Not: The Potential for Urban Water Conservation in California,”in preparation for three years, is the first report to look comprehensively at residential, commercial, institutional, and industrial water use in the state — and then evaluate the potential for reducing this use through conservation and efficiency. Despite the progress California has already made in improving water efficiency, “Waste Not, Want Not” estimates that up to one-third of California’s current urban water use — more than 2.3 million acre-feet — can be saved using existing technology. And at least 85% of this savings (over 2 million acre-feet) can be saved at costs below what it will cost to tap into new sources of supply and without the social, environmental, and economic impacts that any major water project will bring. Read Waste Not, Want Not. Read the Recommendations from the Executive Summary.